Defender B - Kenya Biologics Ltd.
Boron is an essential trace element in the metabolism of plants. It is involved in the absorption and metabolism of calcium, which is accumulated in the cell wall, joining pectins and conferring elasticity and toughness to the tissues. Boron plays an important role in cell division and, therefore, growth. It is also involved in carbohydrate metabolism. Boron availability decreases in soils with a pH greater than 7 due to losses in mobility. In acidic soils of sandy texture boron is lost by being easily washed out of the floor. Its deficiency causes poor growth performance and reduced fruit quality. DEFENDER B can be used both on leaves and roots. Do not apply at peak solar radiation. DEFENDER B is stable for at least two years since manufacturing date. Store in the closed original container in a cool and ventilated area with no higher temperatures than 35ºC. DO NOT store for prolonged periods in direct sunlight. Keep away from food, drink and animal feed. Keep out of the reach of children. 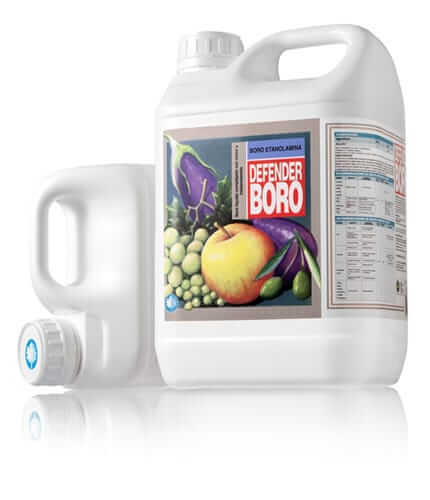 DEFENDER B is compatible with most insecticides and fungicides. Always observe the manufacturer’s mixing recommendations before doing the mixture and if possible do a compatibility test in a small volume. Apply 3 times from the point when the plant has 8 to 10 leaves. Apply 4 times from the point when the plant has 8 to 10 leaves. Apply 2 times at flowering, fattening and summer rest. Apply 2 times at the beginning of cultivation. Apply 2 times at flowering and autumn. Apply 2 times at flowering and fruit.